From a very young age, NHS Junior Grace Beal, daughter of David and Corrine Metz Beal, has proven that she has a heart for serving others. The Lancer Community has been witness to the tremendous impact of Grace’s work through Layups for Lucy, an annual fundraiser she spearheads inspired by her late sister, Lucy. 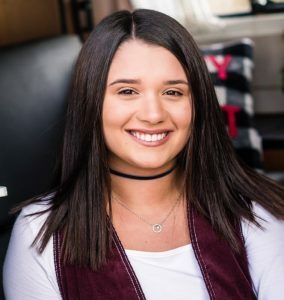 Most recently, Grace was named Pennsylvania’s Top High School Youth Volunteer of 2019 by The Prudential Spirit of Community Awards, a nationwide program honoring young people for outstanding volunteerism. To say that we are proud of Grace and her volunteerism — as well as the way in which she has inspired her peers to serve others — is an understatement. Congratulations, Grace! The Prudential Spirit of Community Awards honors New Castle and Evans City students with $1,000, medallions and trip to nation’s capital. HARRISBURG, PA – Grace Beal, 17, of New Castle and Corbin Edge, 15, of Evans City today were named Pennsylvania’s top two youth volunteers of 2019 by The Prudential Spirit of Community Awards, a nationwide program honoring young people for outstanding acts of volunteerism. As State Honorees, Grace and Corbin will each receive $1,000, an engraved silver medallion and an all-expense-paid trip in early May to Washington, D.C., where they will join the top two honorees from each of the other states and the District of Columbia for four days of national recognition events. During the trip, 10 students will be named America’s Top Youth Volunteers of 2019. In seventh grade, she asked her basketball coaches if her team could shoot layups after practice to raise money for Children’s Hospital. She ended up with almost $6,000. “I was so excited by that outcome that I decided to plan for something even bigger next year,” she said. Grace has hosted “Layups for Lucy” every October since, around the time of Lucy’s birthday. In the early spring, she meets with several dozen students to plan the event’s activities, concessions and entertainment. Last year, there was an elementary basketball clinic, a free throw contest, a student vs. faculty basketball game, a DJ and a magician, a dance line, cheerleader performances, face painting, food and raffle baskets. Grace approaches local and national businesses for sponsorships, oversees all aspects of the event, and meets with officials at the hospital to identify ways her donation can have the most impact. So far, “Layups for Lucy” has funded family outings at the zoo and ballpark, purchased X Boxes and iPads for young patients, and helped support a summer bereavement camp for siblings. The press release continues with information about additional honorees. While in Washington, D.C., the 102 State Honorees — one middle level and one high school student from each state and the District of Columbia — will tour the capital’s landmarks, meet top youth volunteers from other parts of the world, attend a gala awards ceremony at the Smithsonian’s National Museum of Natural History, and visit their congressional representatives on Capitol Hill. On May 6, 10 of the State Honorees — five middle level and five high school students — will be named America’s Top Youth Volunteers of 2019. These National Honorees will receive additional $5,000 awards, gold medallions, crystal trophies and $5,000 grants form The Prudential Foundation for nonprofit charitable organizations of their choice. Since the program began in 1995, more than 125,000 young volunteers have been honored at the local, state and national level. The program also is conducted by Prudential subsidiaries in Japan, South Korea, Taiwan, Ireland, China and Brazil. In addition to granting its own awards, the Prudential Spirit of Community Awards program also distributes President’s Volunteer Service Awards to qualifying Local Honorees. For more information on all of this year’s Prudential Spirit of Community State Honorees and Distinguished Finalists, visit http://spirit.prudential.com or www.nassp.org/spirit.